UPDATE 24/5: ANUSA has condemned violence at the protest and committed to “greater inclusivity” in future events. ANUSA focused on the “generally good nature of the event” in a statement posted on their Facebook page. However, they reminded students that “we do not and never will condone any forms of violence”, in a nod towards the rally fracas. ANUSA’ Education Committee, the chief organisers of the protest, expressed concern that the violence tarnished what was an otherwise successful rally. “There was good turnout and good coverage by the wider media,” said Education Officer Robyn Lewis at a meeting on Wednesday night. Particular concern was expressed regarding the actions of Socialist Alternative (SAlt) members, and how their participation affected student engagement. “We have to deal with the harsh reality of the fact that although SALT can be the most dependable and reliable activists… they can be poison, in the eyes of the student body,” said ANU Labor Left Vice-President Dominic Cradick. “I was not entirely happy with how SALT conducted themselves on the day,” said Lewis, citing SALT’s failure to help set up the protest. 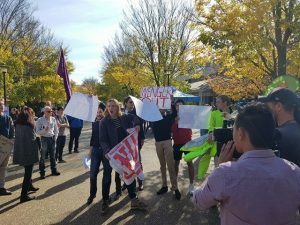 A protest against cuts to higher education almost turned violent today, after Counter-protesters from the ANU Liberal Club marched into Union Court. The counter-protesters’ signs were seized and ripped apart by protesters, amidst pushing, shoving and shouting. A Socialist Alternative (SAlt) member later pushed a newspaper against a counter-protester’s face, leading to allegations of assault. 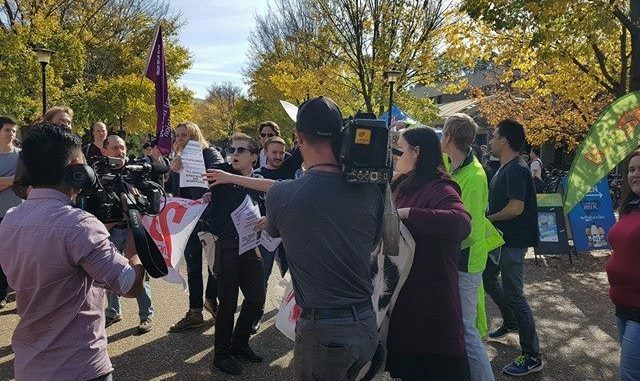 Four counter-protesters approached the demonstration, chanting “NUS is not for me, total waste of student fees”, interrupting the speech of Gabriela Falzon from Unions ACT. They carried signs reading ‘Abolish ANUSA’, ‘Disaccredit and Disaffiliate’, ‘Nuke the NUS’, and ‘WENGER OUT’. The four were all members of the ANU Liberal Club, including President Ramon Bouckaert. The ANU Liberal Club later claimed responsibility for the protest on their Facebook page. 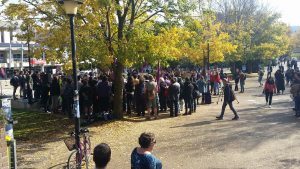 The counter-protesters were shouted down by rally attendees chanting “No Cuts, No Fees, No Corporate Universities”. A fracas ensued: rally attendees seized and destroyed the Liberals’ signs, amidst pushing, shoving and shouting. 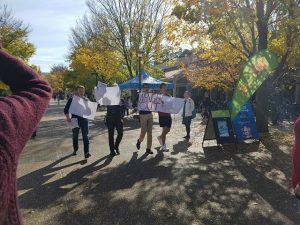 The counter-protesters were separated from the rally by ANU security and Oscar Jolly, Woroni Radio Editor, and the Liberals quickly left. There were chants of “Education should be free, throw the Liberals in the sea” as they departed. 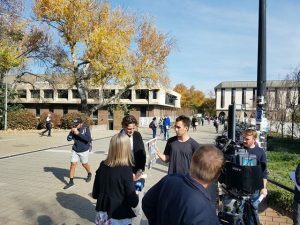 “That’s how the Liberals should be addressed every time they set foot on a university campus,” said Litia Roko, a Socialist Alternative member, “whether it’s a politician or these absolute scumbags”. A second altercation occurred while counter-protester Wesley Mollentze was being interviewed by WIN News. Con Karavias, a member of SAlt , interrupted the interview, calling Mollentze “white privileged wanker” and “rich boy”, and covered Mollentze’s face with a copy of Red Flag. The Socialist Alternative publication came into contact with Mollentze’s face, an event witnessed by multiple reporters. Correction: Removed “Mollentze was not involved in the scuffle but had come later to support the Liberal club.” as Mollentze was captured on video in the scuffle.